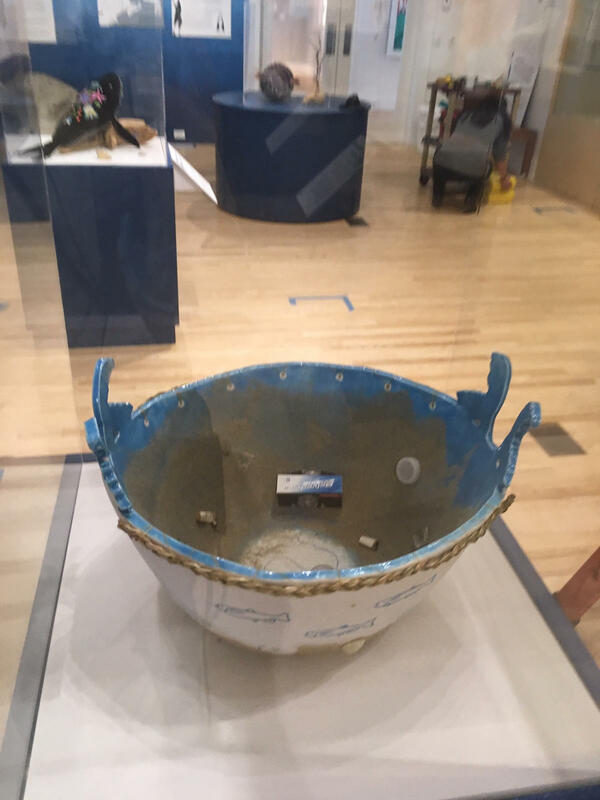 At the Abbe Museum in Bar Harbor, a new exhibit explores the connection between the First People and the northern waters that sustained them for thousands of years, and how that relationship is evolving in reaction to climate change and pollution. The exhibit is a collaboration between the museum and Maritime Indigenous Artists, Inc. It features work by nine artists from New England and the Canadian Maritimes. The rapidly changing climate in Maine and New England is affecting lives – those of the people who depend on the region’s waters, as well as the species that live there. At the Abbe Museum in Bar Harbor, a new exhibit explores the connection between the First People and the northern waters, and how that relationship is evolving in reaction to climate change and pollution. 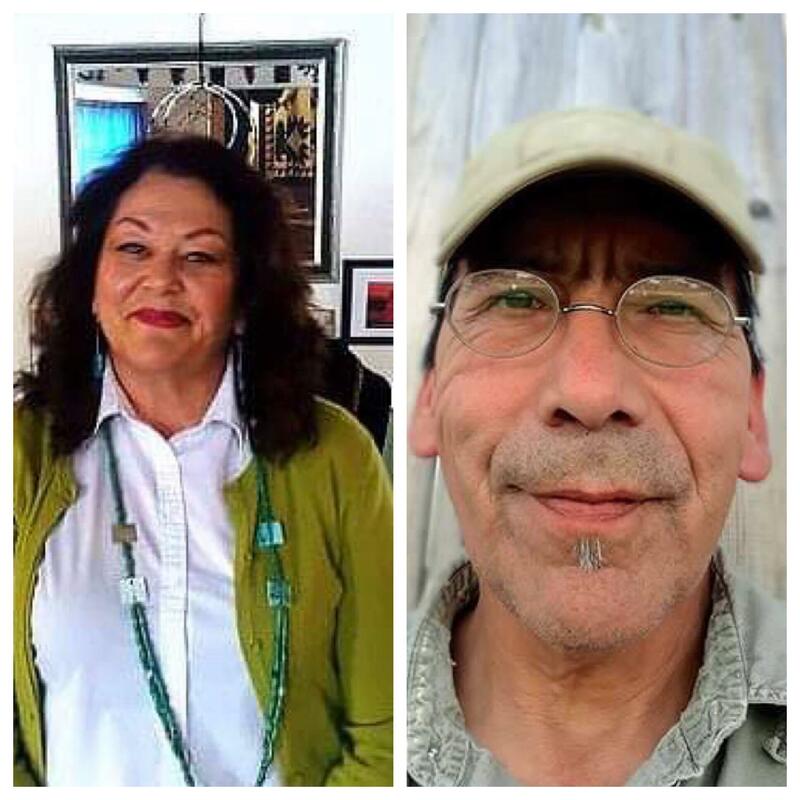 Norma Jean and Allan Saulis are the curators of the new exhibit and the founders of the artists' coalition, Maritime Indigenous Artists (MIA). The exhibit shows that the tribes in Maine are part of a larger cultural and political confederacy that predates modern borders. “As First Nation people, we’ve always viewed an interconnectedness to the water, to the land, to the animals and to nature, and it’s a unique way of looking at the world, in that we really revere all that makes life sustainable,” says Norma Jean Saulis. 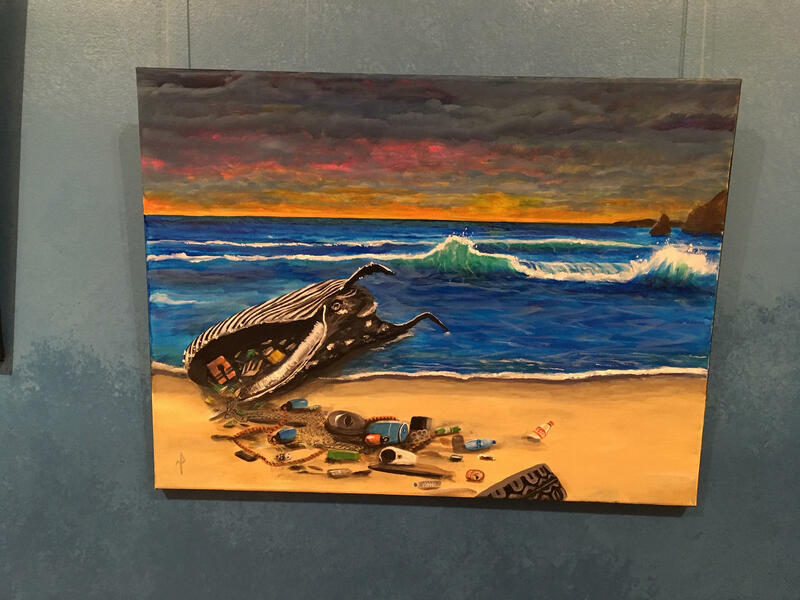 One painting, by Nicholas Paul, depicts a beached whale with trash spilling out of its mouth. Saulis and her husband, Allan, are the curators of the new exhibit and the founders of the artists' coalition, Maritime Indigenous Artists (MIA). 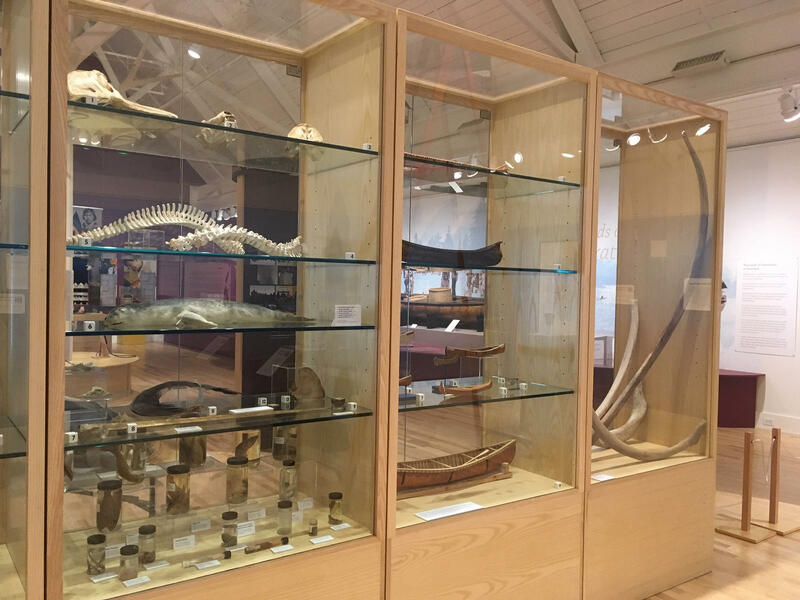 In addition to contemporary art, the exhibit features a display of massive whale bones and preserved specimens of marine life, on loan from the Dorr Museum of Natural History in Bar Harbor. “It’s really cool to combine science and art and nature and to make those connections that the animals in the art that we’re talking about are real beings,” says DeBruyne. The exhibit is also lent context by being in the Abbe, among the museum’s other culture and history exhibits. This mix of science, history and contemporary art helps to connect Indigenous people’s history to what their lives might be like now. A bowl sculpted by Nancy Oakley called "Hidden Truth" is made from clay, sweetgrass, sand and shells - and embedded with garbage, including cigarette butts. The Saulis’ are using their art not only to bridge a knowledge gap, but to bring attention to environmental issues. “We’ve been concerned about global warming and, particularly, about all the plastics,” says Allan Saulis. 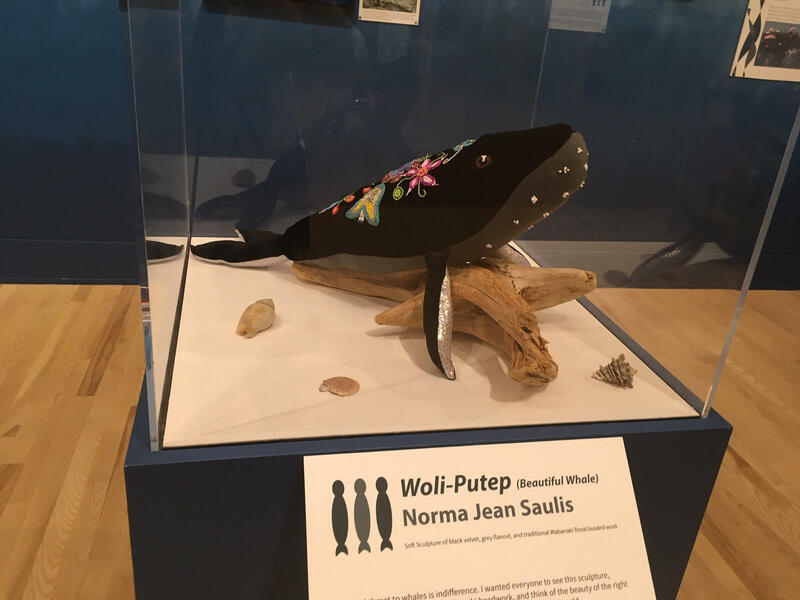 One of Norma Jean Saulis’ contributions to the exhibit is a soft sculpture of an endangered North Atlantic right whale, adorned with traditional, intricate Wabanaki floral beadwork. "I really wanted to show that sometimes if we have a sensitivity or have something look beautiful to us, then we're able to bond with that, we're able to understand that and want to make a difference"
Saulis says she hopes this aesthetic appeal can encourage people to see the right whale in a new light and work to help preserve it. “Using contemporary art and exhibits, different ways of framing this connection, I think, it addresses this presupposed narrative that native people aren’t in this landscape,” says Dr. Darren J. Ranco, Associate Professor of Anthropology and Coordinator of Native American Research at the University of Maine. Ranco specializes in Native American issues and environmental justice studies. He says that, traditionally, Wabanaki cultures are tied to both inland waters and ocean waters, and those ties have changed over the last several hundred years due to a combination of pollution and new policy from colonizers. These changes, he says, are affecting Wabanaki people today. The curators say they hope that the exhibit encourages people to take steps to protect the waters. “I hope it shocks the hell out of them,” he says. wolankeyutomon: Take Care of Everything, opens Thursday, March 21 at the Abbe Museum in Bar Harbor. Originally published 10:31 a.m. March 20, 2019.